Is There an Animal Heaven? At the animal crematorium near us, you can watch your pet’s body enter the flames through a glass wall. 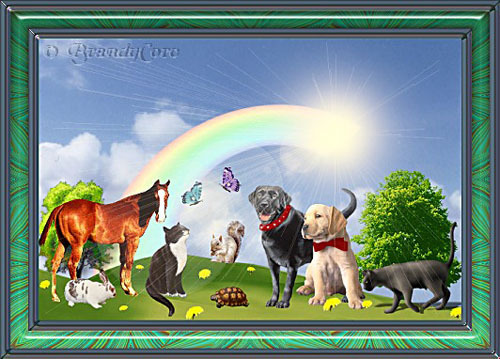 Behind the conveyor belt carrying your pet’s corpse toward the oven is a giant mural of “animal heaven,” an idyllic landscape of mountains, river and flowercarpeted valleys. Fluffy clouds drift across deep blues skies. Butterflies and birds flit about. Sheep frolic on the hills. Dogs play with sticks and roll in electric-green grass. Cats chase their tails. And horses joyfully run at full speed. There is not a human to be seen. Messages from owners are scrolled across the wall—“We will always love you, Rufus;” “Sabine, you were the greatest cat that ever lived.” Costumers were encouraged to write their final words to their pets in a guest book. As I looked through it, I was saddened to find how many people had put their beloved pets to sleep and were asking for forgiveness. Many of the messages conveyed real pain. It has become a truism that the passing of a beloved pet causes a puzzlingly deep grief. People talk about the loss of animals’ unconditional love, their loyalty and willingness to please, as factors. And pets never really grow up. One of my most loved was a Roman street cat named Uggles. Uggles lived to the venerable age of 24, a remarkable life span for any cat. Nevertheless, he stayed a baby, pre-verbal, full of cuddle energy, and about the same size as a one-month old infant. I felt responsible for him in every way. Had I really been doing my job, he would never die but outlive me, as all infant-like creatures should. Only once in a while did it occur to me that were he my son, he would already have finished college and gone on to establishing a career and possibly a family. There is another pain-exacerbating factor, however, and that is the notion of animal heaven. The traditional thinking is that if animals have souls (which of course they do), their souls do not go where we go after we die but someplace else. And that place is separate from ours, made for, and limited to a “lower” consciousness. Animal heaven and the human afterlife at no point connect. There is then, no possibility of meeting again. I’ve had a lot of pets. At one time my husband and I had ten cats, a dog and a chicken living with us. Deaths–all natural–were frequent, yet each one was unique. Together we have assisted every one of them. We got tremendous help from friends and family members already on the other side. Sometimes the dead would tell me when passing would occur, even to the exact minute. I took care to psychically watch my pets’ energy bodies leave, usually lifting out somewhere near the crown of their heads, just as people do. And I was able to follow them for days afterward. The stories are astonishing and I promise one day I will write about them if you want to hear them. Each pet went to a different kind of afterlife. With only one exception, they were taken up by friends and relatives. In my cat Twyla’s case, it was her original owner who took her. He had been dead for some eight years by then. When he grabbed the cat as she shot out of her body he said to me “You’ve had her long enough!” She ended up being the princess of a community of young men who had gathered together to work out their problems. What’s more, most of my pets are aware of each other and when I encounter one I learn from him or her how the others are doing. They, like us, will sometimes stay in a “consensus reality,” often with other animals. A domestic pet will almost always chose a domesticated reality rather than what we would consider an untamed one. Our little cat Rosie, for instance, never cared much for the company of humans. Her afterlife was in a farm setting, similar to where she had lived, in which a few people were seen in the distance. It was a big surprise to me and my husband that directly after her death she wanted the experience of pregnancy and motherhood. Rosie had been sterilized while she was pregnant, hence her need for self-fulfillment was literally and figuratively aborted. She had her kittens within two days. By day four she was already feeling the restraints. She needed to explore her new realm and return to full mobility after her death, rather than be saddled with care taking her babies. I am not claiming that there is real birth in the afterlife. Rosie’s kittens were her own constructions, born out of desire, and they do have a kind of consciousness, but not a primary consciousness. She was soon able to let them go and begin to focus in her new reality. My Turkish street dog was taken by my father. She still lives with him, at least part of the time, although they never knew each other in their incarnated lives. My dog’s happiest moments in life were the walks. She was her most exuberant in corn fields, madly scurrying between the stalks sniffing out hares. She still takes those walks with my father. My beloved Maussie went to the home of his first owner directly after death. The little house was infused with a springtime atmosphere of preternatural beauty. Since then he has moved on, indeed roaming far and wide into dimensions that only he can comprehend. Of all my pets, I hear from him the most, and he is the one who keeps track of all the others. As Maussie shows, the mechanisms of animal consciousness are really no different from ours. They, like us, will gravitate toward conditions in the afterlife that are optimum for their wellbeing at that moment. And like humans, they create portions of their afterlives out of the reality they knew in the body. This is not to say that a pet’s afterlife is limited to animal-human activity. They, like us, have the ability to expand in any direction they can conceive. Nor would wild animals choose such afterlives for themselves. It would be incongruent with what they knew and valued. From what I have seen, herd animals join herds, birds join flocks, gazelles range on unspeakably beautiful plains. Yet they possess powers of mobility that far exceed what they knew in the body. Yes, pigs do fly. And they are safe at last from harm. Research considering thousands of after-death communication experiences has shown that a full 16% of all after-death communication occurs with a person’s pet! What’s more that pet usually shows up with a relative or friend of the person in tow, despite the fact that the deceased human may never have known the pet on earth. Pets are also among the first to great their owners when they pass. So, answering the question “Is there an animal heaven,” I would say no. But there is indeed an animal afterlife, one they can share with us or not depending on their individual needs and mindsets.